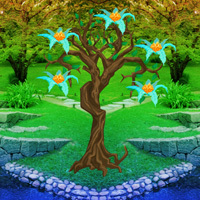 WowEscape - Wow Escape Game: Save the Dead Tree Escape is another point and click escape game developed by Wow Escape. In this game, you came to see the beauty of a forest which is located outer of the city. But unfortunately, you noticed that a tree is going to die. You have to find the way to save the dead tree by finding useful objects, hints and solving puzzles. Click on the objects to interact with them and solve puzzles. Good luck and have fun! Nice little rebus. It's a 4 letter word you're looking for. A wet seesaw is what you need. Knife is use (once) again in the second set of scenes. Ok, probably a small saw. Tree needs a booster shot. Enjoyed the game! Thank you! What tree? Got the syringe. Nvm, the one asking for help of course. To long for me, gotta go. Thank you WOW! Nice game. I agree - nice one, thanks WOW. still need one butterfly, have a ladybug in inventory and don't know where it goes. Ladybird, go back to the yellow gem. Nice game, but I have one pink flower left, that's a bug.